Happy Monday! I hope you had a wonderful weekend. Today we are lucky enough to have a giveaway AND a sale from FabricCadabra. To enter the giveaway, just leave me a comment on this post. If you would like an additional entry into the giveaway, just follow FabricCadabra on Instagram or Facebook and leave me a comment letting me know that you follow them. The giveaway will run through Saturday evening. You can also head over to Mommy by Day Crafter by Night to enter a bundle of Allison Glass' Handcrafted Indigo prints. 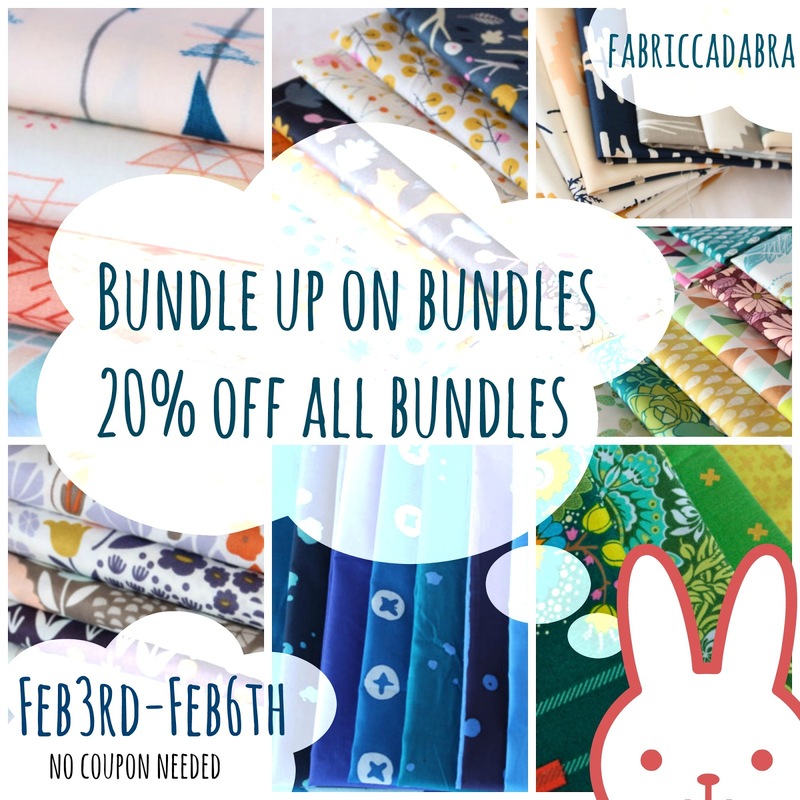 And February 3-6, FabricCadabra will be running a 20% off sale on all bundles. I think I am going to need to stop by to pick up some of these pretty Fleet and Flourish fabrics or some of these Elizabeth Olwen prints. Love your quilt that you created with the Buck print. I would love this bundle! Thank you so much for the chance. I follow FabricCadabra on Facebook. Thanks! 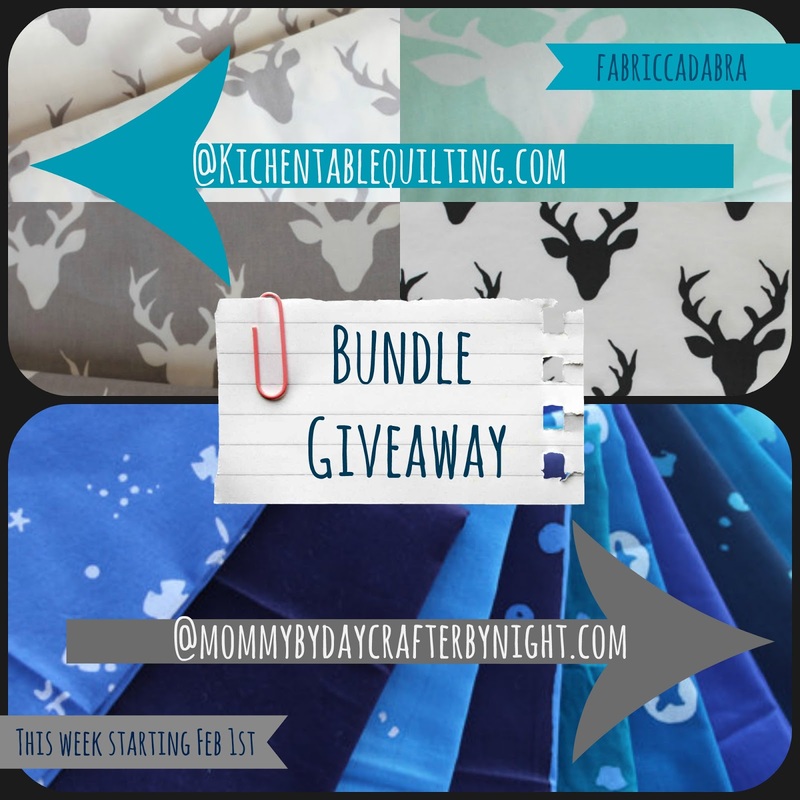 Love these fabrics and thank you for the chance to win! I am following Fabrecadbra on Instagram and I follow you on Facebook as well. Oooh! Count me in! That buck print is amazingly lovely! Perfection!! I love the Buck Print and would love to win. Thank you for this great giveaway! Ooh, great giveaway - not a shop I've heard of before, I always love finding new places to feed my fabric addiction! Lovely fabrics- I would love to have these in my stash. Thanks! Love the Buck print fabric!! I'm following FabricCadabra on instagram. Those fabrics are fun, especially in the new color ways. I have a friend her husband who would love a quilt built around these! I am following FabricCadabra on Facebook! I'm following Fabracadabra on IG (@ agalinsweden) and FB! Fabulous fabric. Thinking of things to make! Such cute fabrics! Thanks for the chance to get to play with them! Wonderful fabrics in beautiful colors! It would be amazing to actually win the giveaway - thank you for the chance. Love the fabrics you're showing. I´m following FabricCadabra on Facebook. Thanks for the fun! Those prints are super cute.Thanks for the chance! I just love the print too! What's not to like? I struggle to find fabrics that work for my nonathletic boys (9 & 11). These buck prints are perfect! I didn't know it came in other colourways--so cute! HAPPY TO FOLLOW Fabricadabra + You on FB! HI, LOVE YOUR FABRIC GIVEAWAY>THANK YOU! They are adorable!! My good friend is having her baby boy soon! If I won, it would be these turned into baby quilts and bibs!! Love those colours and who wouldn't pass up a buck??!! I follow you via Bloglovin and always look forward to opening your posts! I love the buck print too. And now there's additional colourways? Bonus! I follow you via email. Those would be perfect in a baby quilt I need to make for my cousin! Thanks for a chance to win! Love the buck prints! thank you! I really love the Buck prints. The colours are amazing. Thanks for the chance to win them. Love this fabric, and the colours are perfect! Thank you for the opportunity to win these fabrics-I love them. I am now following on Instagram. I love these Buck prints and would have so much fun working with them in a quilt! Thanks for the chance to win! What a lovely fabric bundle! Thanks for the give-away. This fabric is delightful! Thanks for the great giveaway! Very pretty quilt and this fabric is really interesting. Thanks for the cute giveaway. The prints would be great pillows for my brother in law. I have been following in FB. These fabrics are on my Wishlist. Thanks so much for the chance! I love the buck prints! Art Gallery fabrics always feel so nice! Lovely fabrics! Great additional colors! Great giveaway Erica! I follow you every which way and now am following FabricCadabra on Instagram too. I live in an area where everyone but me hunts so I know several young men who would love a quilt made from those fabrics. Love the new color ways! Those Buck prints are the best! I follow FabricCadabra on Instagram. I follow FabricCadabra on Facebook. And I noticed I'm already a follower of Fabricadabra on FB. Lovely fabrics! I haven't worked with them myself but I'd love the chance to! These are great - Thanks! My future daughter-in-love emailed me a picture of a quilt she loves, with a hint that she would love to have it, LOL...and it contains this fabric! I would LOVE to win! Thank you for the chance. Oooh, what great fabric. My hubby would love something from these prints for his cabin. It could join his groundhog quilt. Great fabric! Your Welded quilt came out so cool with those fussy-cut deer. Thanks for the giveaway! I love your quilts and all your inspiration. The quilt you made with this fabric is beautiful! Thanks for the giveaway. your Buck quilt - aaaahhhh. LOVE those prints so much. Love it! Happy they did it in more colorways. Thank you so much for the opportunity to win this print! I discovered it only a couple weeks ago and have decided I NEED it for my husband's first quilt!! I'm heading over to follow you on Instagram!! Thanks again!! I have always loved this print and to see it in different colors is awesome!! I make charity quilts for a kids' chemo unit. There are lots of prints for girls and for little children but I struggle to find more grown-up older boy fabrics. This bundle would be perfect! I love the way you fussy cut the fabric for your quilt. It made the quilt very "manly". Thanks! I follow Fabric Cadabra on Facebook. Love the bucks in lilac!!!! I love the Stag print and the different color ways.Beautiful!! I follow FabricCadabra on Face Book. Thanks for the giveaway! I follow FabriCadabra on instagram! Love the fabrics - great choices!!! What cool fabric. I would be delighted to win. Thank you for a chance to win . Really like the dear fabric. lovely fabrics. thanks for the chance. Any day when I get a chance to sew is a good day. I love those deer antlers. I could have a lot of fun fussy cutting those. I love this print as well as the additional colorways! Thank you for the chance. Such cute fabrics! :) Thanks, Erica! I remember the quilt you made with this fabric. A really nice and calm colored quilt. The new colorways are great also. I have been eyeing this fabric for a while! I love it! Thanks for the chance to win! I follow FabricCadabra on Facebook! I follow FabricCadabra on Instagram! What a great fabric line! Very cute. I love this print, too. I follow FabriCadabra on instagram. I would la la LOVE to win this! <3 soooo pretty! Love this print and I don't have any color so I need to get on it. Also love your Bargain Basement quilt. I'm following Fabriccadabra on IG. Love these prints. Thanks for a chance to win! I love the minty buck. I have just discovered your blog and I love it! If I won the "buck" fabric, I would make a quilt for my daughter, Summer Buck---her real name! Such a cool print. I would love to lay my hands on these fabrics! What delightful fabric! Thanks for thechance to win, and thanks for your inspiring blog! Love these buck prints. Some many fun ideas swirling in my head to use them in. I follow them on instagram as determined_debby. This is such a great graphic print! I love these buck prints! Thanks for the great giveaway! I follow FabricCadabra on IG (@blueskycrafter). Thanks! Oh my, these fabrics would be perfect in a quilt for my Dad. Thanks for the chance to win! I see so many possibilities with such cute fabric!